Today I’ve got a fun project for you that I dug out of the archives! 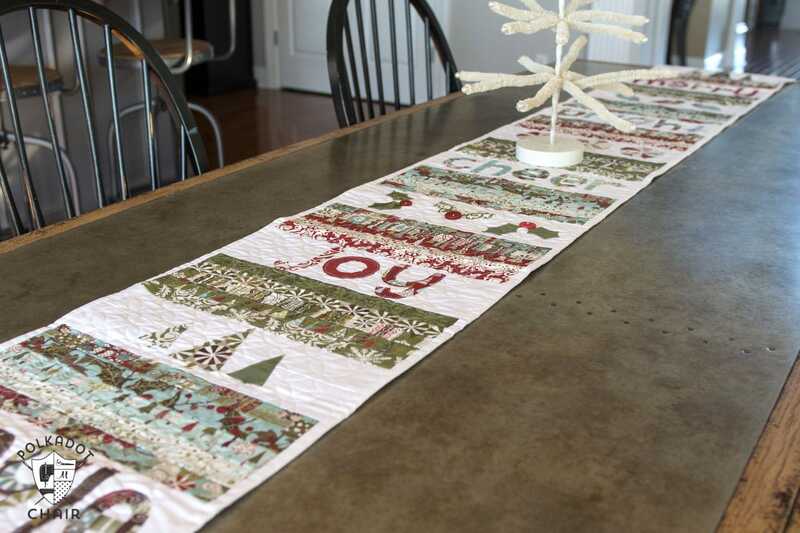 This Quilted Christmas Table Runner Pattern was in desperate need of an update! Enjoy!! 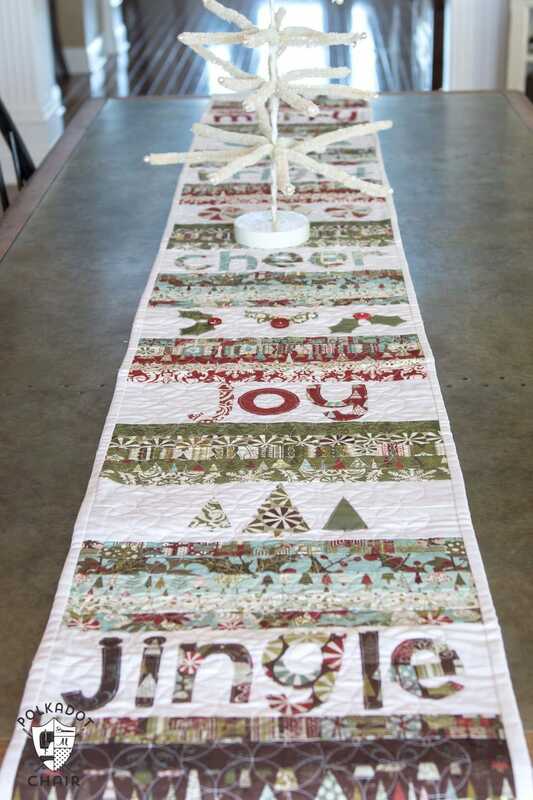 One of the very first quilting projects that I tackled in my “blogging career” was this Skinny Quilted Christmas Table Runner. I still remember the day I got the idea to make it, and sketched it out on a notepad in my house. 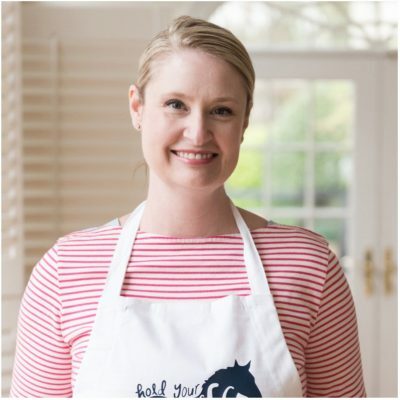 This project was originally posted on the Moda Bake Shop site and now looking back I realize that I had no idea what I was doing! (well for most of it I knew what I was doing, for one part I totally winged it). Things went pretty smoothly until it was time to quilt the runner. I decided that since I had NO idea how to machine quilt that I’d just put the runner in the hoop of my embroidery machine and quilt it once section at time. Bad idea in practice. It took me almost a week to move that LONG table runner through the hoop on my machine. Stitch one square, move the runner, stitch another square, move it again… etc.. over and over and over again. After all of that work, I was so sick of looking at it that I didn’t even know if I liked it anymore. Now several years later I can say that it is one of my favorite Christmas decorations. I’ve gone through and cleaned up the tutorial and added more instructions when needed. I also created a PDF document with the words on it – the font is not a 100% match but it’s pretty dang close. It should save you some time if you make it since you won’t need to design them yourself on the computer first. 10 Fat Quarters (for words) OR one Charm Pack (sometimes called a 5″ stacker). 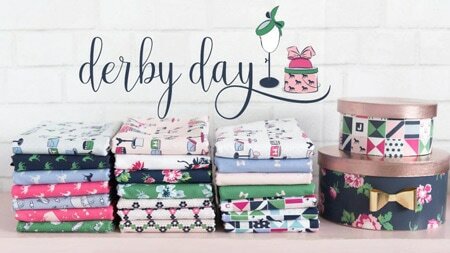 If you want your words to have the same fabric on every letter use fat quarters, if you want the fabrics to be varied, use the charm pack. Download with the templates for the word blocks, get it on the templates page for free, or make your own at home with a font that you like. 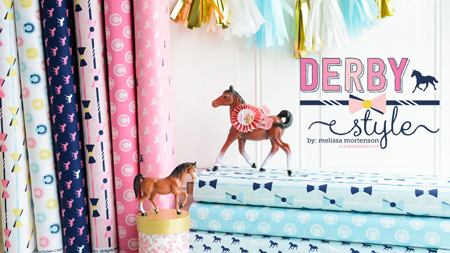 From your roll of 1 1/2″ strips, collect 5 strips each of 4 different color ways. I used the blues, greens, reds & browns. If you are cutting yardage, you’ll want to cut 20, 1 1/2″ strips in 4 different color schemes. Start by working with one color scheme at a time. Arrange the strips in a pattern that you like, and sew together with 1/4″ seam. Press seams to one side. Cut sewn strip into 3, 14″ pieces, cutting off selvage edges. Repeat with the other 3 colors. You will have 3 blocks each of 4 different colors (for a total of 12 blocks). 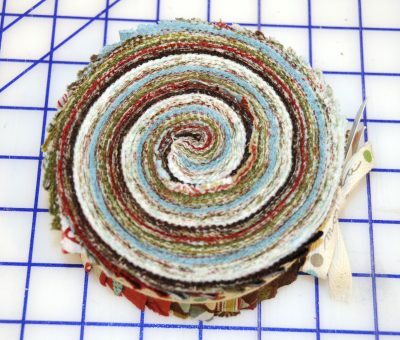 Sew 2 white jelly roll strips together. 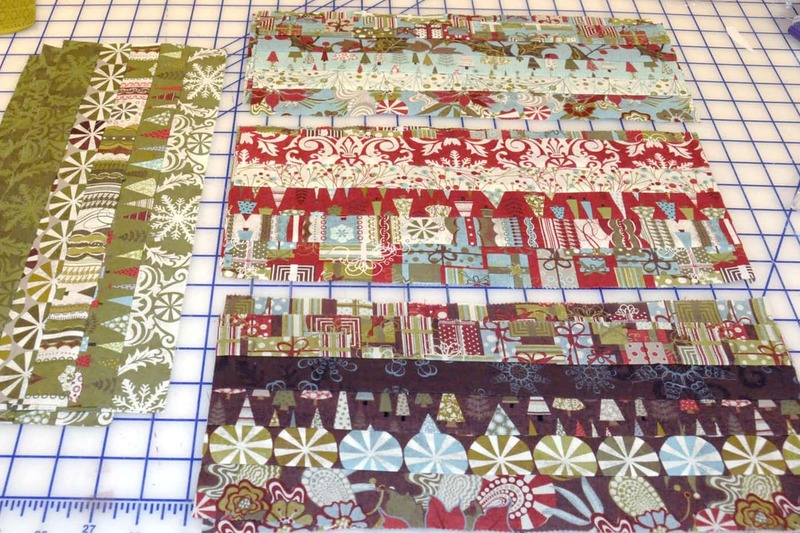 Cut into 14″ pieces (same as you did for the honeybun pieces, remember jelly roll strips are wider, 2 1/2″ wide). 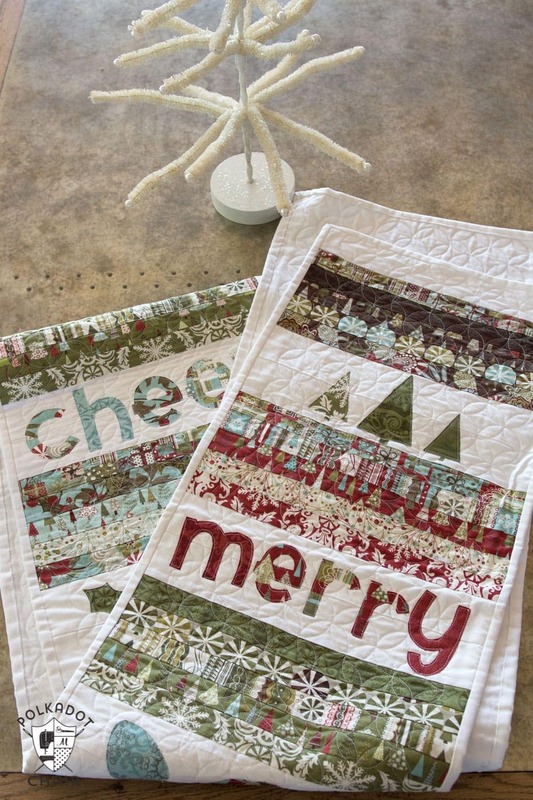 Repeat this 4 times so that you have a total of 10 white blocks each 2 strips tall x 14″ wide. 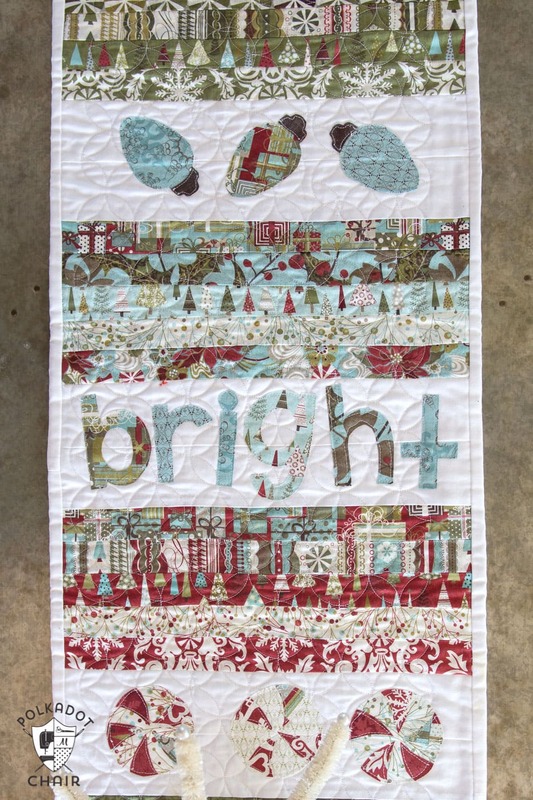 Two 14″ pieces from 1 white jelly roll strip. Note: I quilted this on an embroidery machine so I didn’t have much control over where the stitches went, if you are going to free motion quilting the runner, BEFORE you sew your blocks together, skip to the applique steps below. It will be easier to applique the white blocks before they are sewn with the colored blocks. 23: 1 – 14″ Jelly roll strip. You will have 1 brown block left over, you can use it if you need to make your runner longer. Layer runner with batting and backing and quilt as desired, I quilted mine with an interlocking circle pattern. Print out the document with the words. 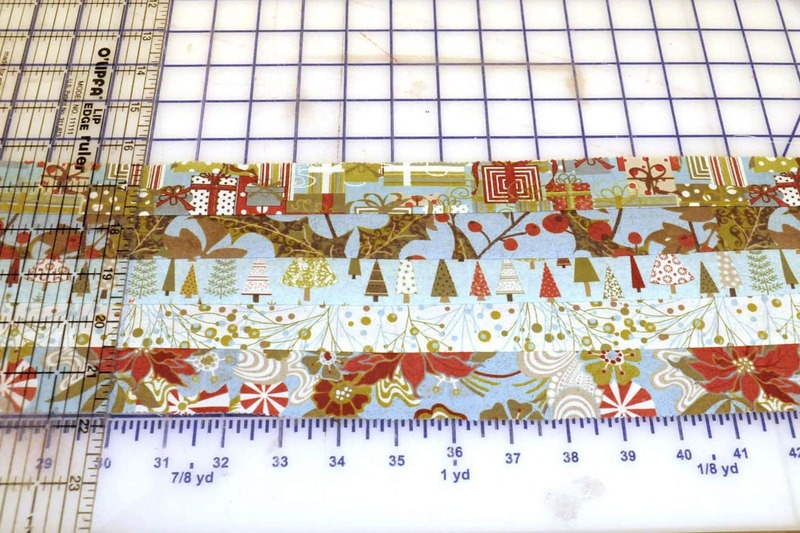 Trace onto the paper side of paper-backed fusible web, (make sure you cut the letters mirrored) cut out loosely, then press onto the wrong side of your fat quarters. Cut out more precisely. For a more detailed tutorial to do this click here. Peel of the paper backing from the letters and arrange on the white blocks in the table runner. When you’ve got them in a spot that you like, iron them in place. This is how I laid out the appliques on my runner: The color in parentheses is the color I cut the applique out of the fabric. For the applique shapes, I used various clipart, for the holly leaves I used Camille’s pattern … The peppermint swirls are also from that pattern, reduced 50%. The trees are just triangles. Order of the white blocks: (refer to photos above). After you iron the appliques onto the runner. Stitch around each with a straight stitch. I just used raw edge applique with a straight stitch. I am okay if it frays (I actually prefer that look for this project). Sew buttons for the holly berries. Thank you, Melissa, for the tutorial! This looks like a great project I can take on for next year. It is adorable! Where would I go to buy that type of fabric- the coordinating honey bun and fat quarters? It is beautiful. Thank you for the tutorial! 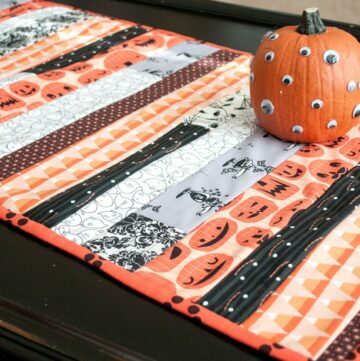 Love your table runner…. 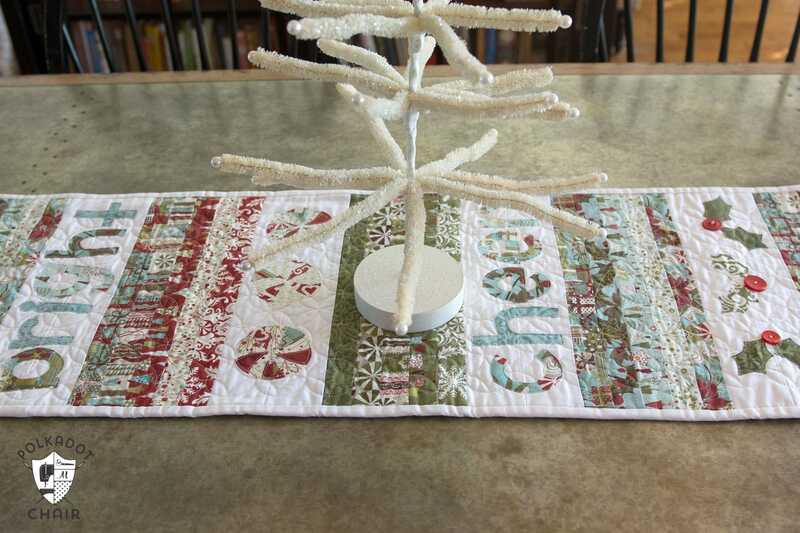 Hi, Melissa, what a beautiful Table runner – thank you very much the tutorial! This is beautiful, so fun!! Thank you so much for sharing! 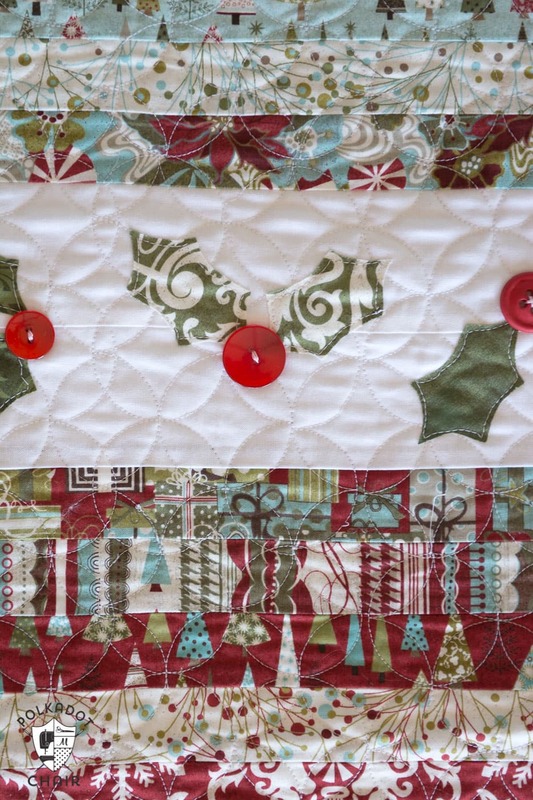 You are using my favorite Christmas fabric ever – Figgy Pudding! I still look for remnants online, I’ve never found a Christmas line I loved as much as that one. 🙂 I wish they would reprint it. I know! 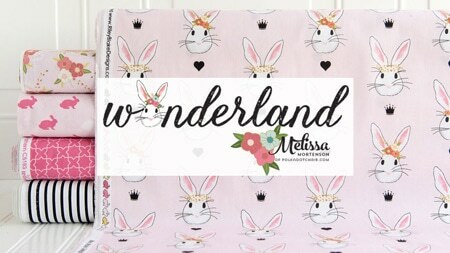 I get so many emails from people asking me where they can get the fabric! I’m going to be sharing this today on The Things She Sews fb page. It’s beautiful! Do you sell these? I want to buy one! 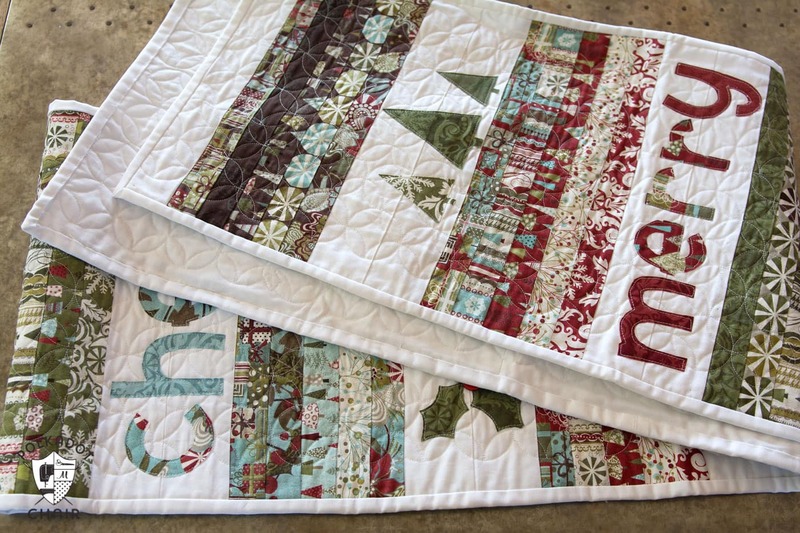 I absolutely love your Christmas quilted table runner. I have absolutely no idea how to sew, embroider etc but would love to buy something like this. I’ve searched and have found nothing similar. Do you sell these? Or would you be willing to make one and sell it? Thank you! Is there a printer friendly version of the pattern? If so, where? Do you mean the pattern pieces or the actual pattern? There is not an actual printer friendly pattern. I used to offer those but heard of many many people taking the print off from my site and selling the patterns. If you have a tablet I think that’s the easiest way to follow along with the pattern. I made two of these after reading your post. I made the first one (for my home) using 1.5″ strips for the color sections and 2.5 strips for the white sections, cut to a width suitable for my table. Then I drew some applique templates by hand and found others online for that part. For the font I used a basic font and then embellished it, creating my own. For the second I needed it done in a weekend so I cut the strips even larger and omitted words, opting for all graphic appliques. I’m donating that one to be sold at my job’s fundraiser for families in need. I’m also adding two matching place mats to complete my set. THANK YOU for sharing such a wonderful project. I’ll be making more for other holidays! Have I missed something? Not sure why blue binding is needed for this project. Oh ignore that. Sorry. This project was originally posted as a “dual” project with the circle tree skirt, I think that line just didn’t get deleted when I split it into two. Thanks! My strips are sewn and pressed, and I’m about to start the appliqued letters. This is so much fun…. I am so excited that I found your blog! 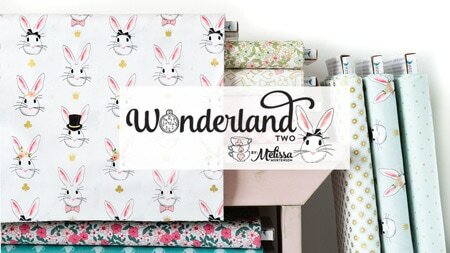 Love, love, love your Wonderland 2 material. Made the cutest baby quilt. What is the finished size of the runner? Maybe I missed reading it somewhere. Thanks. 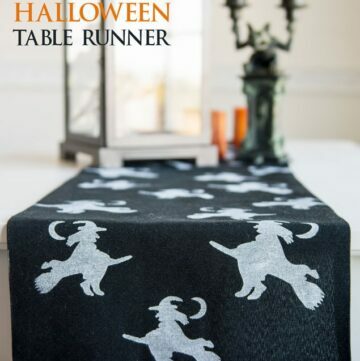 I love, love, love this table runner. If I begin now (February) I’ll be able to complete it before Christmas! I’m having difficulty downloading the letters and other graphics for the table runner. Can you offer any help – please! Thank you. 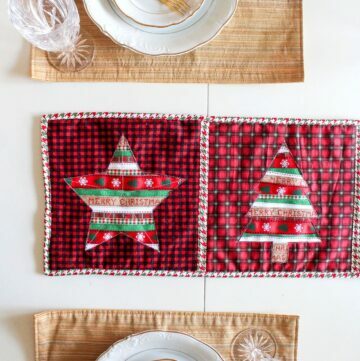 Where is the pdf for the words and applique for the christnas table runner? Ive looked everywhere. Its very frustrating. thank you. There are links within the tutorial for the words and the holly; the rest of the applique you will have to find clipart for yourself. I just finished my top for this project and it is super cute and was easier than I expected. Note, though, that the directions have you add the applique before sewing the blocks together, then later shows the applique being added after the runner is quilted. It would be a good idea to decide ahead of time which method you prefer. I didn’t catch this, so it just pushes me to hand quilt instead of machine quilt. I may still machine quilt the non-appliqued blocks…we shall see. Hope that helps! 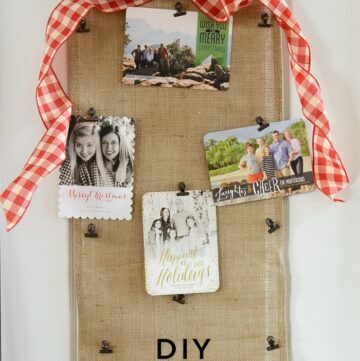 The finished product is adorable either way and thanks, Melissa, for providing this fun tutorial!!! Thanks so much formthe pattern! So cute!